Climate change is a phenomenon that is currently in dire need of a wide range of publicity and other measures, in order for the society to adapt and mitigate its effect. This study examined the level of climate change awareness among the poor-resource farmers in some selected local government areas of Oyo state. A well-structured questionnaire titled "Climate Change Awareness Questionnaire (CCAQ)" was administered to a sample of 240 households. Data collected were analyzed using descriptive statistical tools, such as frequency counts and percentage as well as cross table analysis. Findings indicated that the level of climate change awareness was generally low among the resource poor farmers. Keywords: climate change, environmental awareness, climate change mitigation, climate change adaptation, small farmers, Nigeria. Copyright: © 2012 Adetayo et al. Creative Commons Attribution 3.0 Unported License. Human welfare is inextricably linked to the earth’s climate. Similar to other forms of life, the manner in which human beings respond to climate change is critical not only to survival, but also to well-being (IPCC, 2007 ). Climate change is often used to describe any kind of change in climate, natural or human-induced (Pradhan, 2002 ). Climate-related risks are major causes of human suffering, poverty and reduced opportunity, which lead to large scale human development reversal (Okunade and Ademiluyi, 2009 ). Frequent incidents of extreme weather events have left no continent untouched. All races, all colors, all regions, all continents have in recent times experienced, seen or heard of calamitous incidents (flooding, droughts, desertification, hurricanes, glacier melt, etc). In recent years, above normal rainfall amounts have, however, been recorded in many locations. In Nigeria, particularly, changes in the onset and cessation dates of the wet season have been recorded, with more areas of the country experiencing rainfall instabilities. Despite all these noticeable consequences of climate change in Nigeria, only few understand the causes, and few have any idea of what to do about it. Some do not even agree that it exists. Adaptation measures are designed to assist the vulnerable to cope with and reduce effects and negative impacts, while mitigation actions are designed to reduce the severity or/and prevent the global warming phenomenon. Adaptation to and mitigation of climate change require local knowledge, local competence and local capacity, all within local governments (Ayodele, and Akintola, 1990 ). Climate specialists have reportedly pointed out that a solution to the climate change problem will require climate change awareness and proper understanding of the phenomenon. In order to fast-track the awareness towards climate change, it is necessary to know people’s level of awareness, an issue that is a vital component of long-term policy and planning. The objectives of this study is to determine the level of awareness of climate change in poor resource farmers and identify the farm-level adaptation and mitigation strategies adopted by farmers and their relative effectiveness, vis-a-vis the determination of possible areas of research on adaptation and mitigation strategies to climate change and consequent interventions. The study was carried out in four selected local government areas (Ido, Oluyole, Ona-ara, and Akinyele) within Oyo State. Oyo is an inland state in south-western Nigeria, with its capital at Ibadan. It is bounded in the south by Ogun State and in the north by Kwara State, in the west is bounded partly by Ogun State and partly by the Republic of Benin while in the east it is bounded by Osun State (Fig. 1). These locations were selected based on their classification as rural areas. 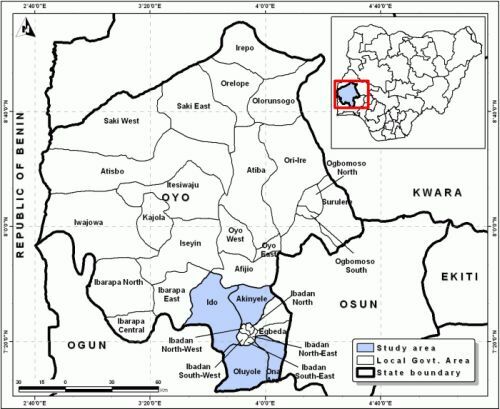 Ido is a local government area in Oyo state with its headquarters in Ido town. It has an area of 986 km2 and the population of 103,261 people (NPC, 2006 ). Idi-Ayunre is the headquarters for Oluyole Local Government, which has a land area of 629 km2 and a population of 2,002,725 (NPC, 2006). Ona-Ara Local Government has its headquarters at Akanran, with a land area of 290 km2 and population of 265,059 (NPC, 2006), while Akinyele has its headquarters at Moniya. It occupies a land area of 464,892 km2, with a population of 239,745 (NPC, 2006). The main economic activity of the inhabitants in all these selected areas is farming. Respondents were selected by multi-stage sampling techniques across the selected agro-ecologies of the state. Data were collected through a field survey using well-structured questionnaires titled "Climate Change Awareness Questionnaire (CCAQ)", which were administered to a sample of 240 respondents selected by probability proportional to household size along the sampling stages. Data were collected with the aid of interview schedule designed to elicit information on socioeconomic and demographic characteristics of respondents, level of awareness, mitigation and adaptation strategies to climate change. They were analyzed using descriptive statistical tools, such as frequency counts and percentage as well as cross table analysis. Table 1 shows the socioeconomic characteristics of the respondents. A total of 240 (196 males and 44 females) people were interviewed. This is in conformation with the assertions that males primarily constituted the major farm labor in Nigeria (Nicholls, and Mimura, 1998 ). Also, it is in line with Nicholls (2004)  that maintains that the major agricultural production activities remain labor intensive due to poor level of mechanization and that women could hardly combine their other non-farm activities with farming. The majority of the respondents were between the ages of 31-40 (84%), This is due to the belief that this is an active age bracket, and should be more enlightened in accordance with the assertion of McGranahan, et al (2007) , who found out that people in the age bracket are likely to be highly innovative. Most of the respondents are Muslims (51.3%) and Christians (42.9%). Married people dominated the communities (90%), while their educational level is primary education. Farming is their major economic activity (43.3%). while others are engaged in trading (20%), are artisans (30%) or unemployed (6.7%). The perception of the respondents about climate change is shown in table 2. From the list of problems encountered in the communities, temperature and rainfall differences are the foremost problems. Other problems mentioned are bad roads, ill health, pollution and insecurity. In the communities, 87.5% of the respondents have heard about climate change. Some refer to it as change in weather conditions at a particular time (40%), some as just weather conditions (17.5%), and others have no response. On the question ‘‘Do you think the problem of climate change can be solved at all?’’, 83.3% of the respondents said yes, 12.5% said no, and the remaining gave no response. Almost all (92.9%) of the respondents agreed that the problem of climate change is affecting them. How they feel the impact differs: some complained of excessive heat (20.8%), for some it is the reduction in rainfall amount received. Concerning mitigation strategies, many of the respondents are of the opinion that stopping air pollution (35%) is the solution, some suggested enlightenment campaign (15%), intensifying research efforts (23.3%), prayers (8.8%), and being religiously committed (3.8%). The coping strategies adopted by the respondents include construction of drainage channels (21.7%), children staying indoors (15.8%), use of local herbs and drugs (30%), raising the level of household properties (15.8%), while 16.7% gave no response. Have you ever heard about climate change? Do you think the problem of climate change can be solved at all? Do you think the problem of climate change affects you as a person? How does the problem of climate change affect you? How do you think an individual can help to overcome the problem of climate change? The perception of the respondents to differences in rainfall and temperature was shown in table 3. 53.4% of the respondents perceived that rainfall has increased steadily, while 36.7% viewed rainfall to have decreased, 4.1%, no change, and others are indifferent. Similar opinion about temperature variation was also noticed. The findings of this investigation show that poor-resource farmers have a low level of climate change awareness. Climate change is a new reality that will have deleterious effects on the society. For this reason, awareness creation is a key measure to address the impact of climate change. Agricultural extentionists can play an important role in educating the farmers about climate change, mitigation and adaptation. There is need for Nigeria and other African nations to include the climate change problem as a vital component of long-term policy and planning, particularly in terms of education and awareness, in order for it to be fully considered by the general public. Environmental awareness among secondary school teachers, a study. Pradhan, G. C. (2002). Education Review 45 (2) 25-27. Adetayo, A., and & Owolade, E. "Climate change and mitigation awareness in small farmers of Oyo State in Nigeria." Open Science Repository Agriculture, Online.open-access (2012), e70081902. 1. A Adetayo, E. Owolade. Open Science Repository Agriculture, Online, e70081902 (2012). 1. Adetayo, A, & Owolade, E. Climate change and mitigation awareness in small farmers of Oyo State in Nigeria. Open Science Repository Agriculture, Online, e70081902 (2012).